The collection is inspired by the myth of Efesto, the divine blacksmith who invented mirror. The dimensions of these mirror sculptures are based on the European standards for paper sheets: simple and recognizable forms that compose an evocative territory. They have been crafted with the technique of implosion, a process in which objects are destroyed by collapsing: it’s a way to show the cooperation between craftsmanship and industry. 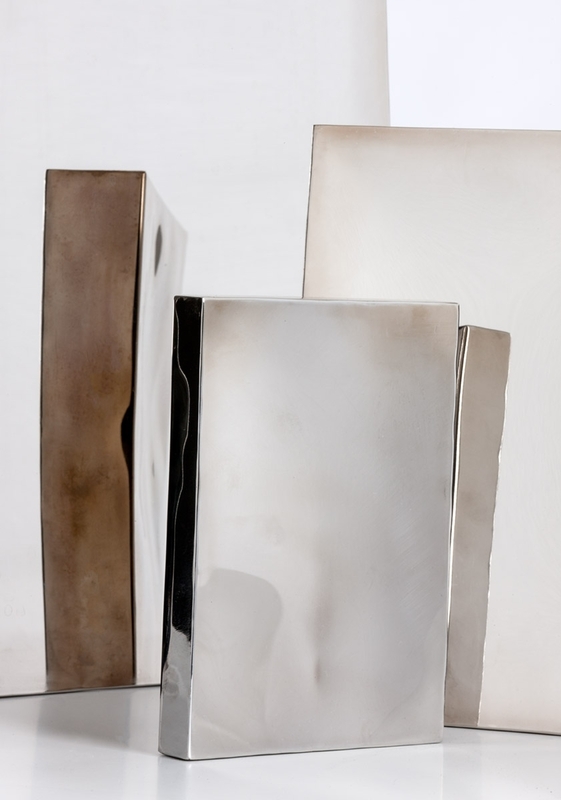 Starting with the implosions, the artisan explores the fluid, liquid dimension of metals, pursuing with the free flame the deformation effects inspired by the distortions of the reflected images on the shiny surfaces. This also adds an iridescent finish, a golden reflection, and oxidations created by heating the metal surfaces to exalt the natural chromatic beauty of metal. The front face is polished to obtain a mirrored effect, while the sides and back are treated with thermo-colouring.